People who make the decision to relieve themselves of the stress created by forcing their way up perilous stairs during a dangerous climb are commendable for being responsible and respectful of those that care about them. Without question, stair lifts on Long Island are an intelligent decision and a wise investment. However, most of us that make the decision to invest in the freedom to utilize our entire house once again, neglect to remember that while it is vital to our mental wellbeing to have access to the entire interior of our homes, we must be able to get inside our houses from the outside first. None of us with an ounce of self-preservation bat an eye at the notion of installing a stair life inside our homes. But, sometimes we fail to consider the face that the stairs outside our homes are equally — and often more — dangerous than those inside our homes, particularly during any kind of weather. Even though we know a ramp is necessary, many of us are concerned about ramp being an eyesore that detracts from the esthetics of our Long Island homes. It is difficult to argue that in the past ramps were not obtrusive objects. However, all StairGlide NY ramp options were designed with practicality and safety in mind, but also appearance. 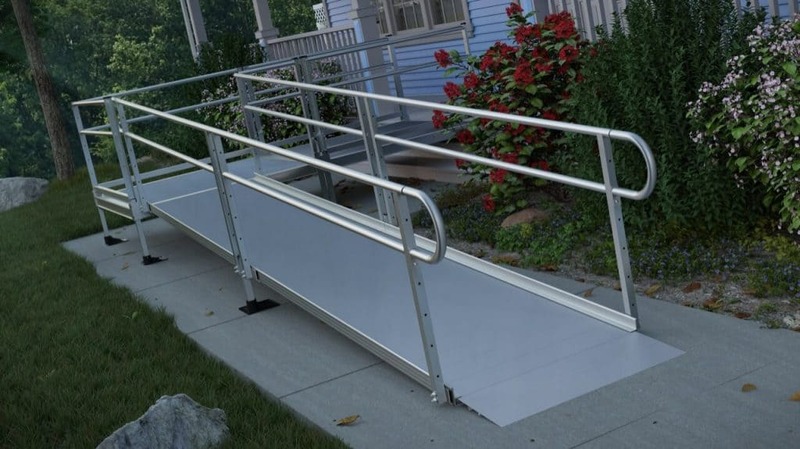 TK Witaker only sells stainless steel ramps on Long Island and while different platform adhesives are used for different climates, every ramp looks professional and simple. We at StairGlide NY sell folding ramps, modular ramps, solid ramps, and threshold ramps on Long Island. In addition, we carry TrekAways and TrekAway adapters for those people who require a mobile ramp or lift. Of those six categories, each is available in several types. For example, our folding ramps are available in: single fold; multifold; multifold reach; rear door van; and bariatric. We have bariatric panel ramps and OnTrac ramps with and without hand rails. While we specialize in home ramps and lifts, we believe that a vehicle is a natural extension of a person’s house. If a person does not have the ability to go from their home to their vehicle and back, their world is limited. As such, we carry a large selection of mobile ramps and lifts. Our TrekAway carriers and adapters are mobile ramps and lifts of the highest quality. We sell 12 different models, each capable of a variety of tasks. In order to choose the right one for you, all you must do is prioritize your tasks. At StairGlide NY, we pride ourselves on providing options for every individual’s specific needs. But sometimes, the premade configurations that most ramps come in don’t fit your situation. That’s why we are pleased to offer Modular Ramps to our customers. Modular Ramps allow for your mobility needs to be met on a permanent basis, while simultaneously being very fast and easy to install and reconfigure. One modular ramps can be set up in many different configurations, making them the ideal solution for your specific mobility needs. No matter what kind of complex porch design, step architecture or difficult landscape you may have around your outside stairs, our Modular Ramps can be set up to provide easy access to your home. At StairGlide NY, we can open your world up, starting with your home.